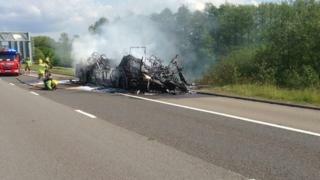 The northbound carriageway in Warwickshire was shut for almost two hours while firefighters dealt with the blaze between junctions 3 and 3a near Coleshill. Paramedics said they were assessing two children but no-one was hurt as all passengers disembarked safely. One lane has now reopened but drivers have been warned of delays.